obtained the product certification by NIPPON KAIJI KYOKAI (ClassNK)　>> " Certification"
In recent years, there is a concern for fuel oil with paraffin wax (long chain linear hydrocarbons etc.). Paraffin wax precipitates as solid crystals in fuel oil at low temperatures, this follows that the fluidity of fuel oil is lost. Such cold flow property phenomenon is found in distillates such as MGO and MDO. If this occurs in a storage tank or in a strainer and or purifier, it becomes difficult to transfer the fuel oil. Wax Breaker is a fuel oil additive for solving issues as shown above. A specimen is cooled at the specified rate and examined periodically. The temperature at which a cloud is first observed at the bottom of the test jar is recorded as the "Cloud Point". A specimen of the sample is cooled under the specified conditions, and at intervals of 1 °C, is then drawn into the pipet under the controlled vacuum through the standardized wire mesh filter. The procedure is repeated, as the specimen continues to cool, for each 1 °C below the first test temperature. Testing is continued until the amount of wax crystals that have separated out of solution is sufficient to stop or slow down the flow so that the time taken to fill the pipet exceeds 60 seconds or the fuel fails to return completely to the test jar before the fuel has cooled by a further 1 °C. The indicated temperature at which the last filtration was commenced is recorded as the "Cold Filter Plugging Point". After preliminary heating, the sample is cooled at the specified rate and examined at intervals of 3 °C for flow characteristics. The lowest temperature at which movement of the specimen is observed is recorded as the "Pour Point". What is a paraffin wax component (long chain linear hydrocarbon etc.)? The paraffin wax is substances of a nature that solidifies as it cools like a candle wax. 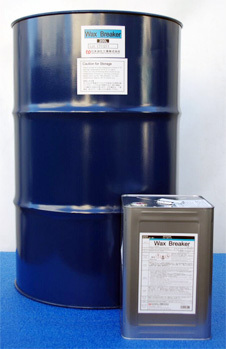 The paraffin wax component contained in the fuel oil is derived from crude oil and fractions to be blended. *The standard dosing rate is assuming usage situation at minimum temperature of "5 ° C" in engine room. Wax Breaker can improve the CFPP of various MGO (LSGO) and MDO to 5 °C or less at the dosing rate is 1/2000 ~ 1/500 (500 ~ 2000 ppm). When dosing rate of Wax Breaker is 1/500, CFPP of MGO (with very high Pour Point) is improved from 16 °C to 4 °C, it will prevent from blockage at storage tank, strainer and purifier. 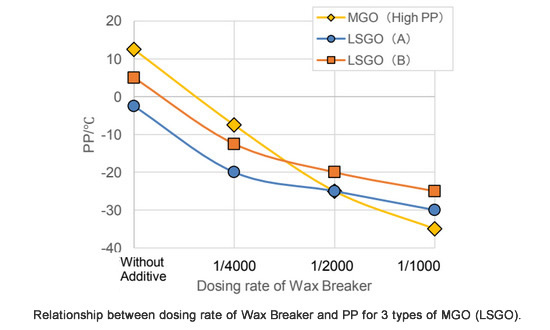 Wax Breaker can improve the PP of various MGO (LSGO) and MDO to minus 10 °C or less at the dosing rate is 1/2000 (500 ppm). By improving PP, Wax Breaker will prevent fuel oil solidification in storage tank, it can be possible to transfer MGO and MDO with poor cold flow properties to the engine room from the storage tank in cold areas. Please feel free to contact us if you are interested with cold flow properties of fuel oil or have any problems regarding the fuel oil with poor cold properties.